The Student Activities Office (SAO) is one of several units with the HUB department. SAO staff encourage UW students to participate in student activities and student government as an excellent way to experience personal growth, meet new friends, share common interests with other students, faculty and staff. The goal of SAO is to help students develop skills in leadership, event planning and management, decision-making, communication, goal setting, fiscal management, marketing and promotion, and even more importantly, to make life at UW fun and memorable. Are you a new RSO officer getting ready to lead your organization? Are you an outgoing officer who needs to pass down important RSO information and prepare your new officer? Officer transitions allow outgoing officers to pass on RSO information and documents to incoming officers and prepare them for a successful year. Come learn about how to hold an officer transition, why we need them, and what they entail. 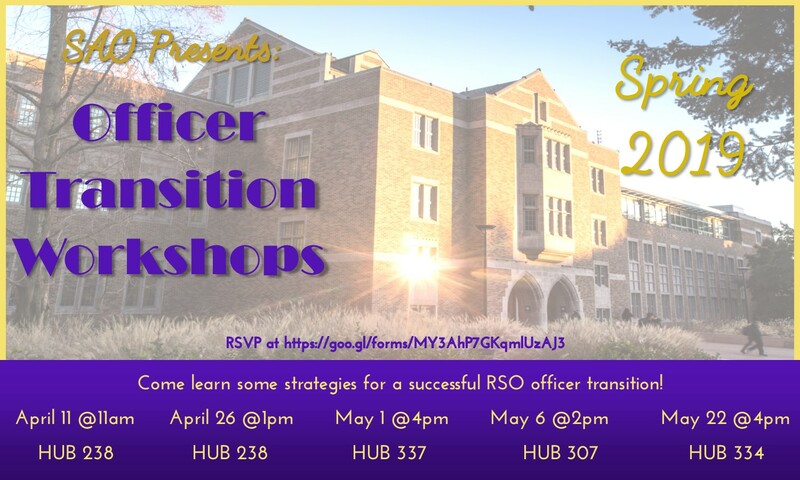 RSVP for an Officer Transition Workshop! A limited number of registration sessions are available Spring Quarter, beginning April 17 through May 21, 2019. Visit the HUB Trumba Calendar, find a date, and register! Groups registering Spring Quarter must complete all registration requirements by 5 pm Wednesday, May 29, 2019. A limited number of registration sessions are available Winter Quarter, beginning January 14 through February 7, 2019. Visit the HUB Trumba Calendar, find a date, and register! Groups registering Winter Quarter must complete all registration requirements by 5 pm Wednesday, February 14, 2019. 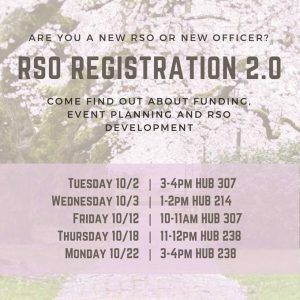 Are you a new RSO or a new Officer? View the RSO Policy Guide for information on Security for Speakers.